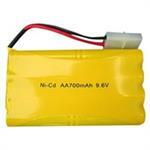 9.6 volt 1650mAh Ni-MH TYCO-style high-capacity battery and Speed Charger. Battery comes with with TAMIYA connector; plugs right into charger. Re-charges battery in about 5-6 hours. Fits in many RC toys: cars, trucks, Tanks, planes, Dinos, Robots. Battery is 4" x 2.5" x 0.6". Battery packs are MADE IN USA by BATTERIES AMERICA. 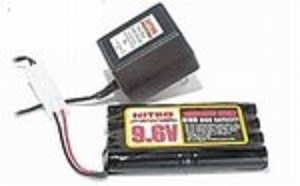 TYCO-700: 9.6 volt 700mAh rechargeable battery for RC models. Includes TAMIYA connector. Charges up with supplied charger for 9.6v, OR with our SPEED CHARGER (sold separately). These battery packs are made by US in the U.S.A.